My one-hundred-and-seventy-sixth podcast is up. 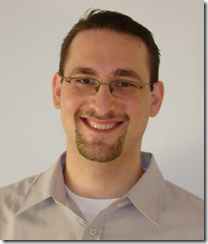 Udi Dahan is an Enterprise Development Expert and also the author of NServiceBus. Udi educates Scott on how a service bus works, and how it fits into a world of brokers, workflows and services. Today your blog's default page has five photographs of people on it, including the frame from the Chris Sells vid. All five people have the same beard. Scott asked: "Did Microsoft drop the ball?" Microsoft does have a framework called the 'CCR & DSS Toolkit' that can be used as a service bus and/or as a broker and seems to have many of the same attributes as NServiceBus. Goatees for developers, black turtle-necks for designers. It's so you can spot them better in the wild. Great show, i'm going to get all our Devs to listen to it. We have implemented our first nServiceBus in production with great results. I would love to hear Udi get more into the details of what makes nServiceBus tick. We are trying to have small teams working on applications that have a narrow focus to keep them simple and allow us release often and respond quickly to unanticipated business needs. MS SQL Server's Service Broker is also a light, transactional, distributed, asynchronous way of distributing messages accross applications (Despite the "broker" in the name). I would have loved to hear Udi on this one.